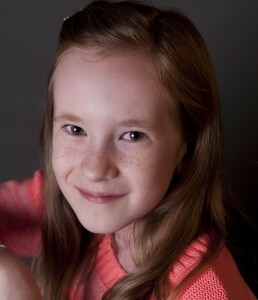 Marlowe Tilney is nine years old and has been acting up for as long as her parents can remember. Marlowe has participated in a number of theater camps and workshops including the Wicked Cool Performing Arts camp, the Concord Youth Theater program, and the Middlesex Community College’s Children’s Theater Program—a three-week long theater intensive culminating in a full production of The Little Mermaid, Junior, in which Marlowe played a seagull, a chef, and a clam. Marlowe recently appeared in the 2014 Playwrights’ Platform Summer Theatre Festival, playing the role of young Lauren in “Growing Up.” In her spare time, Marlowe wants to be whatever rocks her boat at the moment, including a rock star, restaurateur, and fashion designer.